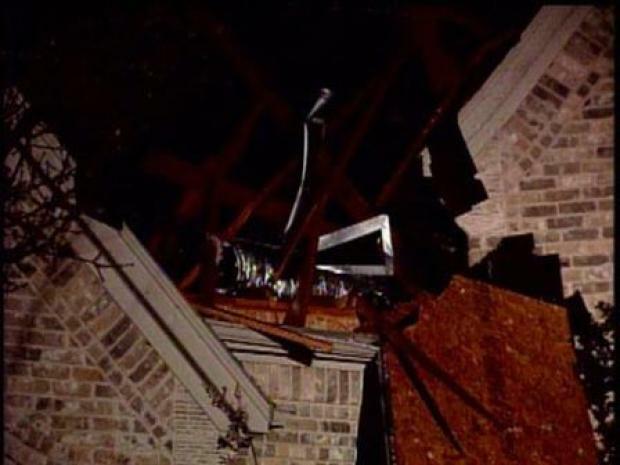 Tornado rips roof off of Colleyville home. The majority of the roof of Gene Drautz's Colleyville home was ripped off in Tuesday night's storm. Residents in at least two Colleyville neighborhoods are assessing the damage after an E-F 1 tornado touched down during Tuesday night's savage winter storm. The tornado, which was confirmed by the National Weather Service late Wednesday morning, was estimated to be 100 yards wide and left a damage path of about a half-mile long. On the Enhanced Fujita scale, an E-F 1 tornado is a moderate tornado with wind speeds between 73 and 112 mph. The storm damaged about 10 homes along Sapphire Circle, tearing away shingles and roofing material, uprooting trees and tossing debris throughout the neighborhood. "It was very intense," said Whitney Stark. "We were just putting the kids down, and all of a sudden, a boom, like an explosion. We thought an airplane hit the house." 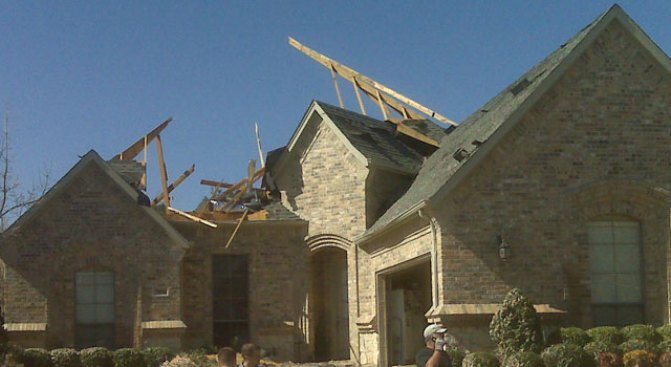 High winds during Tuesday's storm ripped the roof off of a home in Colleyville. A trampoline from Stark's backyard ended up across the street in Phet Manyloun's driveway. "I'm just thankful we're alive, you know -- and none of us got hurt," said Manyloun. "No one really knows what happened. Like I said, it was instant. " About half a mile north, in the Villas at Caldwell's Creek, the damage was far worse. So far, Gene Drautz's home appears to have suffered the most amount of damage from the storm. Drautz said he was asleep Tuesday night when he woke to an incredible noise. "All of a sudden a real loud thud ... and it sounded to me like maybe an airplane hit my roof," he said. Drautz and his wife sought shelter in their bathroom. "We saw it coming," he said. "It looked like a tornado coming this way. It hit, and I jumped out of bed and shoved my wife in the bathroom there." They didn't realize the extent of the damage until after the storm had passed. Drautz said he and his wife went outside to find his neighbor's tree at his front door and the majority of their roof in his neighbor's back yard. "It's just amazing. You always see it ... you never dream that you'll be part of it. But those things happen in life," Drautz said. Dan Birgelaitis said he could hear his neighbor's roof coming off. "I could hear -- literally hear -- his roof lifting off, the sound of nails coming out of wood; just 'eerrrrr,' that gut-wrenching sound," he said. "The jet noise, the sound of his roof coming off, the roof hitting ours, plus the damage we had -- honestly, (we had) 10 seconds, 10 seconds; really not even time to respond." Firefighters arrived at Drautz's home and used chainsaws to clear the tree from the entryway and off of what was left of his roof. "You can always replace your belongings, but God spared our lives, and that's what matters," Drautz said. Many residents said they heard the sirens go off. Officials with the National Weather Service say that might have given the residents just enough time to scramble for safety.